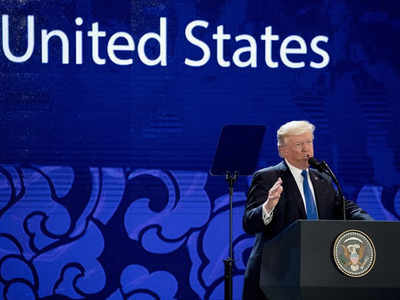 DANANG: President Donald Trump stood before a summit of Asian leaders keen on regional trade pacts and delivered a roaring "America first" message Friday, denouncing China for unfair trade practices just a day after he had heaped praise on President Xi Jinping in Beijing. The president — who pulled the United States out of the Pacific Rim trade pact known as the Trans-Pacific Partnership — said the US would no longer join "large agreements that tie our hands, surrender our sovereignty and make meaningful enforcement practically impossible." Instead, he said, the US will pursue one-on-one trade deals with other nations that pledge fair and reciprocal trade. As for China, Trump said he'd spoken "openly and directly" with Xi about the nation's abusive trade practices and "the enormous trade deficits they have produces with the United States." It was a stark change in tone from the day before, when Trump was Xi's guest of honor during a state visit in Beijing. There, Trump opted for flattering Xi and blaming past US presidents for the trade deficit. But Trump added forceful complaints about "the audacious theft of intellectual property," ?massive subsidizing of industries through colossal state-owned enterprises," and American companies being targeted by "state-affiliated actors for economic gain." US officials have raised similar concerns in the past about China, especially with regard to intellectual property. When asked about the outcome, Russian Foreign Minister Sergei Lavrov later snapped at reporters: "Why are you asking me? Ask the Americans." Putin spokesman Dmitry Peskov said that even without a formal meeting, "Both presidents are in town, and their paths will cross one way or another." Separately, a 16-member region-wide pact called the Regional Comprehensive Economic Partnership was also under negotiation. It encompasses China and India but also does not include the US. You think you can talk to high-ranking people of other countries this way and be listened to seriously? They all have their own interests and can only see Trump as someone incapable of understanding reality. He just sounds like one more bellowing hog.